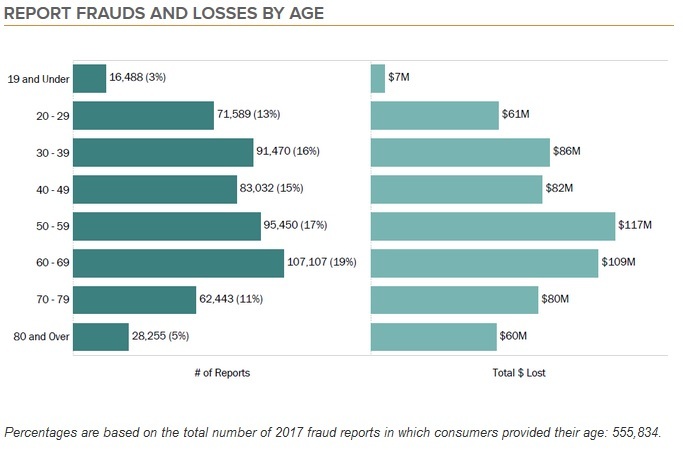 220 posts categorized "Scams & Threats"
Last week, David Chavern, the President and CEO of News Media Alliance (NMA), testified before the House Judiciary Committee. The NMA is a nonprofit trade association representing over 2,000 news organizations across the United States. Mr. Chavern's testimony focused upon the problem of fake news, often aided by social networking platform. "... Quality journalism is essential to a healthy and functioning democracy -- and my members are united in their desire to fight for its future. Too often in today’s information-driven environment, news is included in the broad term "digital content." It’s actually much more important than that. While some low-quality entertainment or posts by friends can be disappointing, inaccurate information about world events can be immediately destructive. Civil society depends upon the availability of real, accurate news. The internet represents an extraordinary opportunity for broader understanding and education. We have never been more interconnected or had easier and quicker means of communication. However, as currently structured, the digital ecosystem gives tremendous viewpoint control and economic power to a very small number of companies – the tech platforms that distribute online content. That control and power must come with new responsibilities... Historically, newspapers controlled the distribution of their product; the news. They invested in the journalism required to deliver it, and then printed it in a form that could be handed directly to readers. No other party decided who got access to the information, or on what terms. The distribution of online news is now dominated by the major technology platforms. 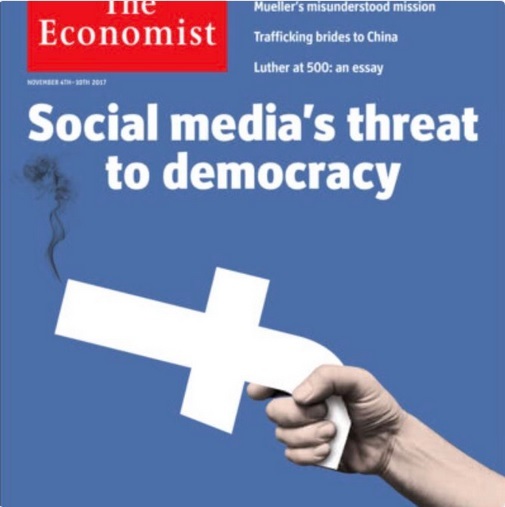 They decide what news is delivered and to whom – and they control the economics of digital news..."
Last month, a survey found that roughly two-thirds of U.S. adults (68%) use Facebook.com, and about three-quarters of those use the social networking site daily. In 2016, a survey found that 62 percent of adults in the United States get their news from social networking sites. The corresponding statistic in 2012 was 49 percent. That 2016 survey also found that fewer social media users get their news from other platforms: local television (46 percent), cable TV (31 percent), nightly network TV (30 percent), news websites/apps (28 percent), radio (25 percent), and print newspapers (20 percent). "The First Amendment prohibits the government from regulating the press. But it doesn’t prevent Facebook and Google from acting as de facto regulators of the news business. Neither Google nor Facebook are – or have ever been – "neutral pipes." To the contrary, their businesses depend upon their ability to make nuanced decisions through sophisticated algorithms about how and when content is delivered to users. The term “algorithm” makes these decisions seem scientific and neutral. The fact is that, while their decision processes may be highly-automated, both companies make extensive editorial judgments about accuracy, relevance, newsworthiness and many other criteria. The business models of Facebook and Google are complex and varied. However, we do know that they are both immense advertising platforms that sell people’s time and attention. Their "secret algorithms" are used to cultivate that time and attention. We have seen many examples of the types of content favored by these systems – namely, click-bait and anything that can generate outrage, disgust and passion. Their systems also favor giving users information like that which they previously consumed, thereby generating intense filter bubbles and undermining common understandings of issues and challenges. All of these things are antithetical to a healthy news business – and a healthy democracy..."
"Good journalism is factual, verified and takes into account multiple points of view. It can take a lot of time and investment. Most particularly, it requires someone to take responsibility for what is published. Whether or not one agrees with a particular piece of journalism, my members put their names on their product and stand behind it. Readers know where to send complaints. The same cannot be said of the sea of bad information that is delivered by the platforms in paid priority over my members’ quality information. The major platforms’ control over distribution also threatens the quality of news for another reason: it results in the “commoditization” of news. Many news publishers have spent decades – often more than a century – establishing their brands. Readers know the brands that they can trust — publishers whose reporting demonstrates the principles of verification, accuracy and fidelity to facts. The major platforms, however, work hard to erase these distinctions. Publishers are forced to squeeze their content into uniform, homogeneous formats. The result is that every digital publication starts to look the same. This is reinforced by things like the Google News Carousel, which encourages users to flick back and forth through articles on the same topic without ever noticing the publisher. This erosion of news publishers’ brands has played no small part in the rise of "fake news." When hard news sources and tabloids all look the same, how is a customer supposed to tell the difference? The bottom line is that while Facebook and Google claim that they do not want to be "arbiters of truth," they are continually making huge decisions on how and to whom news content is delivered. These decisions too often favor free and commoditized junk over quality journalism. The platforms created by both companies could be wonderful means for distributing important and high-quality information about the world. But, for that to happen, they must accept accountability for the power they have and the ultimate impacts their decisions have on our economic, social and political systems..."
"When Facebook changed its algorithm earlier this year to focus on “meaningful” interactions, publishers across the board were hit hard. However, local news seemed particularly vulnerable to the alterations. To assuage this issue, the company announced that it would prioritize news related to local towns and metro areas where a user resided... To determine how positively that tweak affected local news outlets, the Tow Center measured interactions for posts from publications coming from 13 metro areas... The survey found that 11 out of those 13 have consistently seen a drop in traffic between January 1 and April 1 of 2018, allowing the results to show how outlets are faring nine weeks after the algorithm change. According to the Tow Center study, three outlets saw interactions on their pages decrease by a dramatic 50%. These include The Dallas Morning News, The Denver Post, and The San Francisco Chronicle. The Atlanta Journal-Constitution saw interactions drop by 46%." Early in my business career, I had the opportunity to develop and market an online service using content from Dow Jones News/Retrieval. That experience taught me that the news - hard news - included who, where, when, and what happened. Everything else is either opinion, commentary, analysis, an advertisement, or fiction. And, it is critical to know the differences and/or learn to spot each type. Otherwise, you are likely to be misled, misinformed, or fooled. Many People Are Concerned About Facebook. Any Other Tech Companies Pose Privacy Threats? The massive data breach involving Facebook and Cambridge Analytica focused attention and privacy concerns on the social networking giant. Reports about extensive tracking of users and non-users, testimony by its CEO before the U.S. Congress, and online tools allegedly allowing advertisers to violate federal housing laws have also focused attention on Facebook. Are there any other tech or advertising companies which consumers should have privacy concerns about? What other companies collect massive amounts of information about consumers? It seems wise to look beyond Facebook in to avoid missing significant threats. "... Alphabet Inc.’s Google is a far bigger threat by many measures: the volume of information it gathers, the reach of its tracking and the time people spend on its sites and apps... It’s likely that Google has shadow profiles on at least as many people as Facebook does, says Chandler Givens, chief executive of TrackOff, which develops software to fight identity theft. Google allows everyone, whether they have a Google account or not, to opt out of its ad targeting. Yet, like Facebook, it continues to gather your data... Google Analytics is far and away the web’s most dominant analytics platform. Used on the sites of about half of the biggest companies in the U.S., it has a total reach of 30 million to 50 million sites. Google Analytics tracks you whether or not you are logged in... Google uses, among other things, our browsing and search history, apps we’ve installed, demographics such as age and gender and, from its own analytics and other sources, where we’ve shopped in the real world. Google says it doesn’t use information from “sensitive categories” such as race, religion, sexual orientation or health..."
There's plenty more, so read the entire WSJ article. A good review worthy of further discussion. However, more companies pose privacy threats. Equifax, one of three major credit reporting agencies, easily makes my list. Its massive data breach affected half the population in the USA, plus persons worldwide. An investigation discovered several data security failures at Equifax. Also on my list would be the U.S. Federal Communications Commission (FCC). Using some "light touch" legal ju-jitsu and vague promises of enabling infrastructure investments, the Republican-majority Commissioners and Trump appointee Ajit Pai at the FCC revoked broadband privacy protections for consumers last year... and punted broadband oversight responsibility to the U.S. Federal Trade Commission (FTC). This allowed corporate internet service providers (ISPs) to freely track and collect sensitive data about internet users without requiring notices nor opt-out mechanisms. "... failed to disclose a significant breach of consumer data that occurred in 2016 -- in the midst of the FTC’s investigation that led to the August 2017 settlement announcement... the revised settlement could subject Uber to civil penalties if it fails to notify the FTC of certain future incidents involving unauthorized access of consumer information... In announcing the original proposed settlement with Uber in August 2017, the FTC charged that the company had failed to live up to its claims that it closely monitored employee access to rider and driver data and that it deployed reasonable measures to secure personal information stored on a third-party cloud provider’s servers. In the revised complaint, the FTC alleges that Uber learned in November 2016 that intruders had again accessed consumer data the company stored on its third-party cloud provider’s servers by using an access key an Uber engineer had posted on a code-sharing website... the intruders used the access key to download from Uber’s cloud storage unencrypted files that contained more than 25 million names and email addresses, 22 million names and mobile phone numbers, and 600,000 names and driver’s license numbers of U.S. Uber drivers and riders... Uber paid the intruders $100,000 through its third-party “bug bounty” program and failed to disclose the breach to consumers or the Commission until November 2017... the new provisions in the revised proposed order include requirements for Uber to submit to the Commission all the reports from the required third-party audits of Uber’s privacy program rather than only the initial such report..."
Yes, Wells Fargo bank makes my list, too. This blog post explains why. Who is on your list of the biggest privacy threats to consumers? "... Facebook acknowledged that before and after last year’s American election, between January 2015 and August this year, 146m users may have seen Russian misinformation on its platform. Google’s YouTube admitted to 1,108 Russian-linked videos and Twitter to 36,746 accounts. Far from bringing enlightenment, social media have been spreading poison. Russia’s trouble-making is only the start. From South Africa to Spain, politics is getting uglier... by spreading untruth and outrage, corroding voters’ judgment and aggravating partisanship, social media erode the conditions..."
"Senator Patrick Leahy (D-Vt) said Facebook still has many pages that appear to have been created by the Internet Research Agency, a pro-Kremlin group that bought advertising during the campaign. Senator Al Franken (D-Minn.) said some Russian-backed advertisers even paid for the ads in Russian currency. "How could you not connect those two dots?" he asked Facebook general council Colin Stretch. "It's a signal we should have been alert to and, in hindsight, one we missed," Stretch answered." "Google attorney Richard Salgado said his company's platform is not a newspaper, which has legal responsibilities different from technology platforms. "We are not a newspaper. We are a platform that shares information," he said. "This is a platform from which news can be read from many sources." "... like other internet platforms, we have found some evidence of efforts to misuse our platforms during the 2016 U.S. election by actors linked to the Internet Research Agency in Russia... We have been conducting a thorough investigation related to the U.S. election across our products drawing on the work of our information security team, research into misinformation campaigns from our teams, and leads provided by other companies. Today, we are sharing results from that investigation... We will be launching several new initiatives to provide more transparency and enhance security, which we also detail in these information sheets: what we found, steps against phishing and hacking, and our work going forward..."
"... aggravates the politics of contempt that took hold, in the United States at least, in the 1990s. Because different sides see different facts, they share no empirical basis for reaching a compromise. Because each side hears time and again that the other lot are good for nothing but lying, bad faith and slander, the system has even less room for empathy. Because people are sucked into a maelstrom of pettiness, scandal and outrage, they lose sight of what matters for the society they share. This tends to discredit the compromises and subtleties of liberal democracy, and to boost the politicians who feed off conspiracy and nativism..."
When citizens (via their elected representatives) can't agree nor compromise, then government gridlock results. Nothing gets done. Frustration builds among voters. "When Facebook farms out items to independent outfits for fact-checking, the evidence that it moderates behavior is mixed. Moreover, politics is not like other kinds of speech; it is dangerous to ask a handful of big firms to deem what is healthy for society. "Breaking up social-media giants might make sense in antitrust terms, but it would not help with political speech—indeed, by multiplying the number of platforms, it could make the industry harder to manage." All of the solutions have advantages and disadvantages. It seems the problems will be with us for a long while. Social media has been abused... and will continue to be abused. Comments? What solutions do you think would be best? "The bug, known as "KRACK" for Key Reinstallation Attack, exposes a fundamental flaw in WPA2, a common protocol used in securing most modern wireless networks. Mathy Vanhoef, a computer security academic, who found the flaw, said the weakness lies in the protocol's four-way handshake, which securely allows new devices with a pre-shared password to join the network... The bug represents a complete breakdown of the WPA2 protocol, for both personal and enterprise devices -- putting every supported device at risk." Reportedly, the vulnerability was confirmed on Monday by U.S. Homeland Security's cyber-emergency unit US-CERT, which had warned vendors about two months ago. What should consumers do? Experts advise consumers to update the software in all mobile devices connected to their home wireless router. Obviously, that means first contacting the maker of your home wireless router, or your Internet Service Provider (ISP), for software patches to fix the security vulnerability. "... could also be devastating for IoT devices, as vendors often fail to implement acceptable security standards or update systems in the supply chain, which has already led to millions of vulnerable and unpatched Internet-of-things (IoT) devices being exposed for use by botnets." So, plenty of home devices must also be updated. That includes both devices you'd expect (e.g., televisions, printers, smart speakers and assistants, security systems, door locks and cameras, utility meters, hot water heaters, thermostats, refrigerators, robotic vacuum cleaners, lawn mowers) and devices you might not expect (e.g., mouse traps, wine bottles, crock pots, toy dolls, and trash/recycle bins). One "price" of wireless convenience is the responsibility for consumers and device makers to continually update the security software in internet-connected devices. Nobody wants their home router and devices participating in scammers' and fraudsters' botnets with malicious software. "In general, Windows and newer versions of iOS are unaffected, but the bug can have a serious impact on Android 6.0 Marshmallow and newer... At the time of writing, neither Toshiba and Samsung responded to our requests for comment..."
Hopefully, all of the Internet-connected devices in your home provide for software updates. If not, then you probably have some choices ahead: whether to keep that device or upgrade to better device for security. Comments? "An analysis by security firm Duo Security of more than 73,000 Macs shows that a surprising number remained vulnerable to such attacks even though they received OS updates that were supposed to patch the EFI firmware. On average, 4.2 percent of the Macs analyzed ran EFI versions that were different from what was prescribed by the hardware model and OS version. 47 Mac models remained vulnerable to the original Thunderstrike, and 31 remained vulnerable to Thunderstrike 2. At least 16 models received no EFI updates at all. EFI updates for other models were inconsistently successful, with the 21.5-inch iMac released in late 2015 topping the list, with 43 percent of those sampled running the wrong version." "... they give attackers control that starts with the very first instruction a Mac receives... the level of control attackers get far exceeds what they gain by exploiting vulnerabilities in the OS... That means an attacker who compromises a computer's EFI can bypass higher-level security controls, such as those built into the OS or, assuming one is running for extra protection, a virtual machine hypervisor. An EFI infection is also extremely hard to detect and even harder to remedy, as it can survive even after a hard drive is wiped or replaced and a clean version of the OS is installed." At-risk EFI versions mean that devices running Windows and Linux operating systems are also vulnerable. Reportedly, the exploit requires plenty of computing and technical expertise, so hackers would probably pursue high-value targets (e.g., journalists, attorneys, government officials, contractors with government clearances) first. "Always deploy the full update package as released by Apple, do not remove separate packages from the bundle updater... When possible, deploy Combo OS updates instead of Delta updates... As a general rule of thumb, always run the latest version of macOS..."
Scary, huh? The nature of the attack means that hackers probably can disable the anti-virus software on your device(s), and you probably wouldn't know you've been hacked. If you haven't received them yet, you probably will soon. 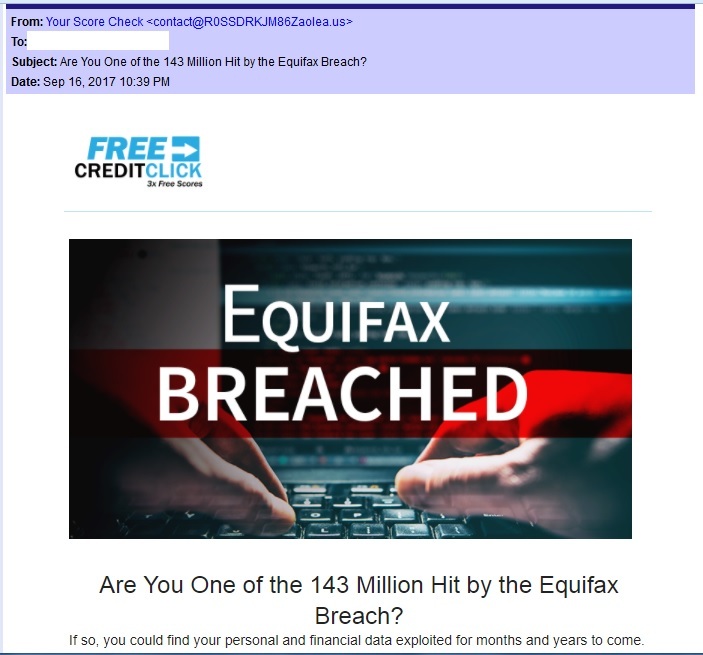 Here comes the spam - unwanted e-mail messages - from scammers, supposedly related to the massive Equifax data breach. 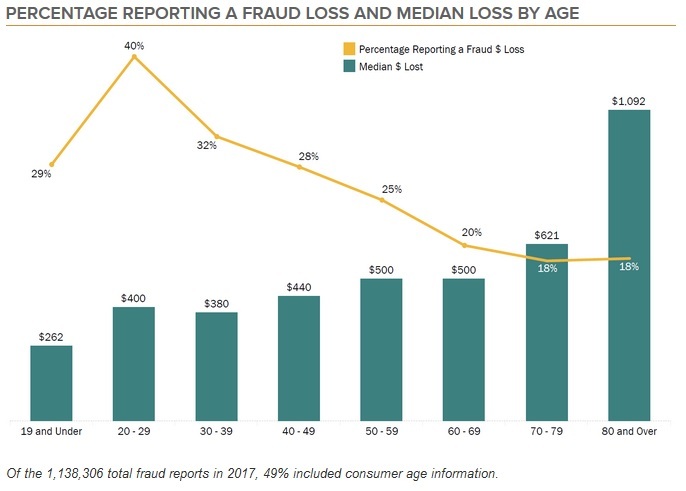 The spam will likely include phishing attacks: attempts to trick consumers into disclosing sensitive bank account and payment data. The message doesn't list a price for its offer. The company name -- FreeCreditClick -- implies the offer is free. Key items in the e-mail don't match. The company name in the "From" field doesn't match the e-mail address. Nor does the company name in the "From" field match the company name in the body of the message. The sender's e-mail address in the "From" field includes a version of an e-mail address I've seen before in other spam. The Equifax site already directs consumers affected by the data breach to an Equifax site to learn how to get protection (e.g., credit monitoring and fraud resolution services) for free. 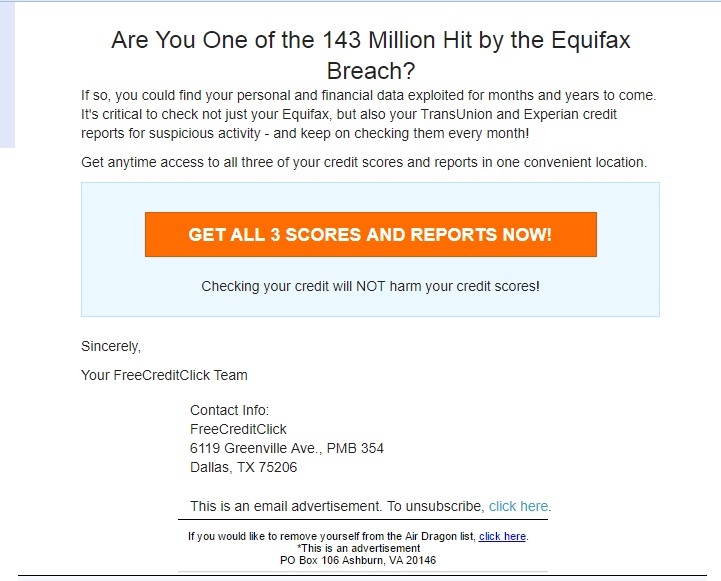 The e-mail offers credit reports from the three major credit reporting agencies: Experian, Equifax, and TransUnion. Informed consumers know that the official website for free credit reports is annualcreditreport.com. Informed consumers know that while there are several brands of credit scores, they probably need a single good one. The e-mail contains order and unsubscribe links with destinations that doesn't match either the company's name in "1" nor "2." 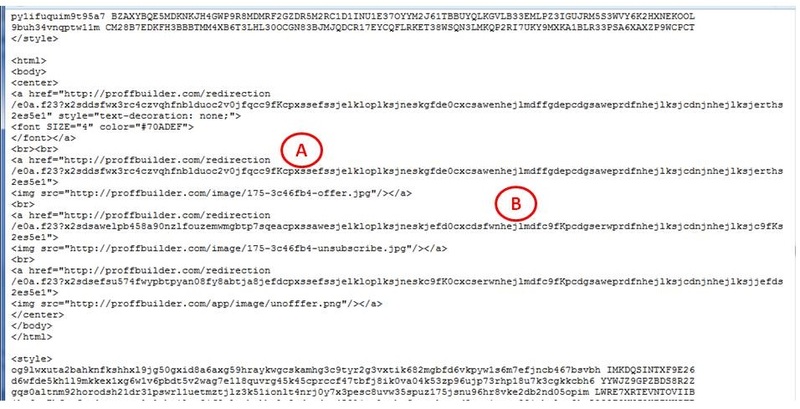 The destinations for both the order link (A) and the unsubscribe link (B) contain the "proffbuilder.com" site and embedded redirect commands. The redirect commands could take your web browser anywhere. Too risky, so I did not click on them. As best I can tell, this definitely is spam. I don't trust it. What do you think?